I have wanted to come up with my own healthy Gyoza meatball recipe ever since The Clothes Make the Girl ‘Gyoza Meatballs’ recipe was shared in the Skinnymixers Facebook Group. 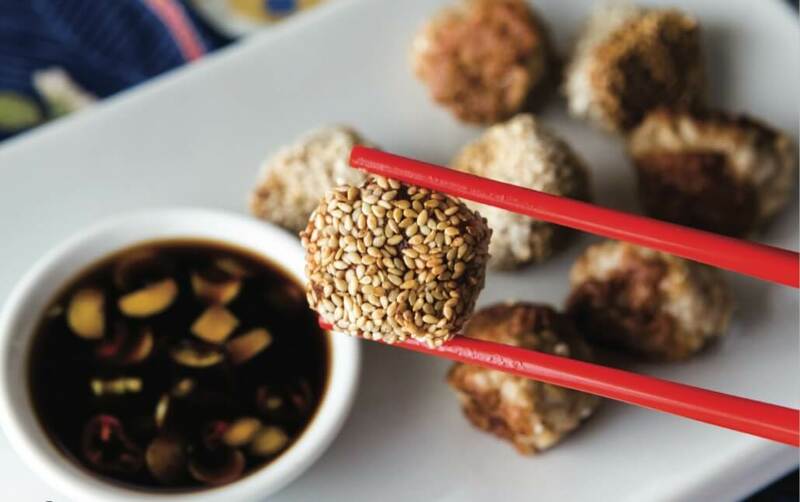 These meatballs are packed full of flavour and are so versatile suitable for canapés, entrees, lunch boxes and main meals accompanied with stir-fried Chinese greens. There is a Seafood Free variation in the book also. Can you use fresh Shitake mushrooms? Oh crap! Should say gold – Thanks bloody auto-correct! Substituted pork with chicken . Didnt use sesame seeds as i forgot to buy them. these were so yummy. Glad i decided to try them. I made them a few weeks ago and they are super delicious. Jam packed with flavour….like all of Niks recipes. I absolutely love these! They’re super delicious! I’ve made them with chicken and beef mince and both times there were sooo good!! These Gyoza are a must try! Even my prawn hating husband enjoyed them. I made these onion free (allergy) and they were amazing. I served them with steamed rice and stir fried Asian veggies. Another delicious meal, thanks Nik. The husband and the turdler absolutely love the seafood variation of these!